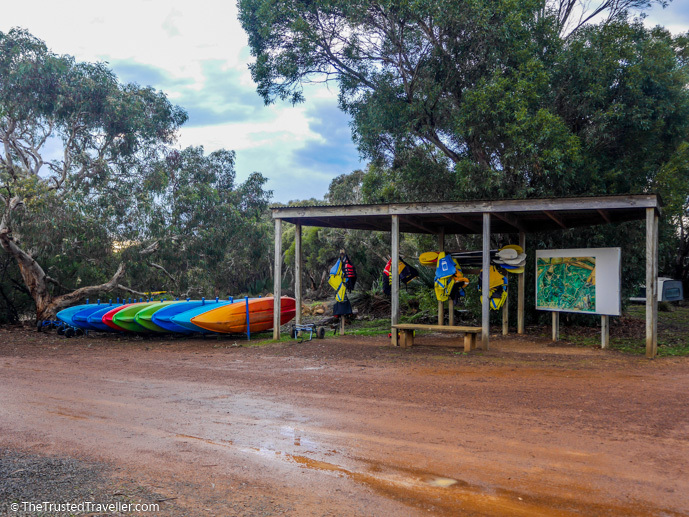 If you’ve never visited Kangaroo Island before, and have just a few days (or less) to spend on the island, then we can guarantee you’ll have a busy few days with such an abundance of incredible things to see and do. You’ll end each day happy, but exhausted and, in need of a comfortable and relaxing place to stay. The Vivonne Bay Lodge is an excellent choice and after our recent stay, we want to tell you why. Kangaroo Island is bigger than most people expect so having a central base for exploring the whole island is important. Vivonne Bay Lodge is located in the Kangaroo Island township of Vivonne Bay, in the middle of the south coast. The 206 hectare property has 1 km of beach frontage, a beach that is said to be one of the world’s best. 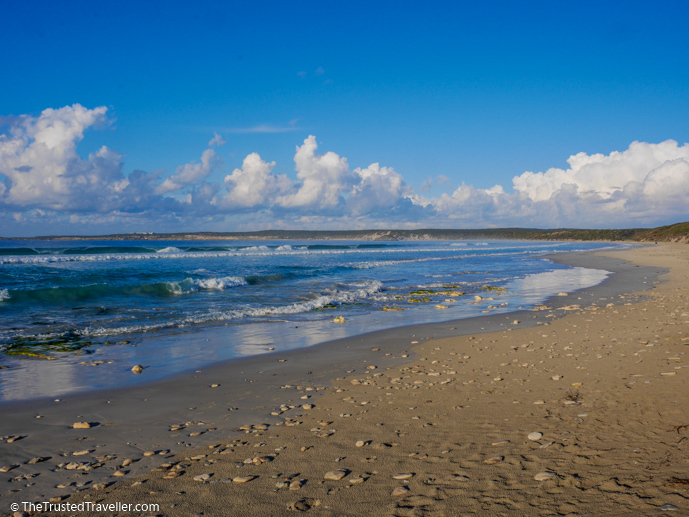 Nearby are most of the islands best attractions including the Raptor Domain (15 minute’s drive), Seal Bay (25 minute’s drive) and Flinder’s Chase National Park (30 minute’s drive). In the township you’ll find a general store that sells basic groceries, fuel and takeaway meals. And then just a 30 minute drive away is the town of Parndana, where you’ll find a proper supermarket and pub. 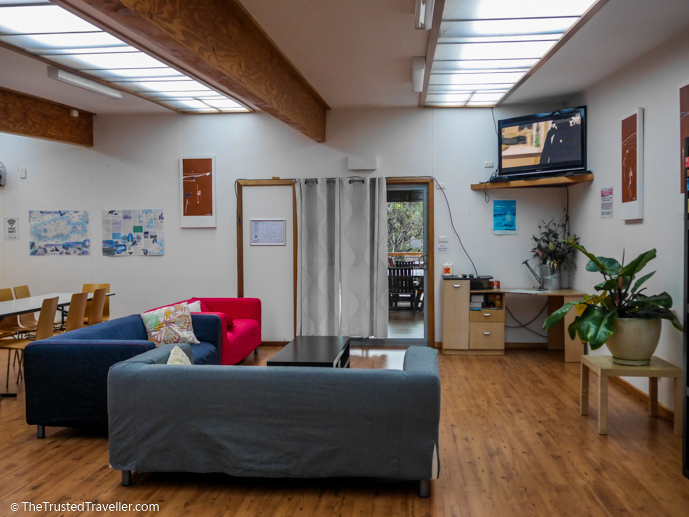 Technically, Vivonne Bay Lodge is backpacker style accommodation, but don’t let that put you off if it’s not a style of accommodation you’re used to. 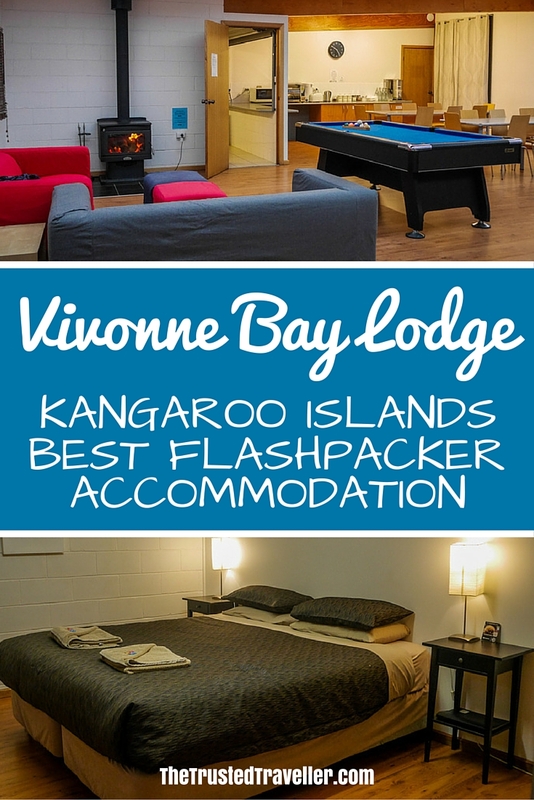 From our experience staying in similar accommodation around the world, Vivonne Bay Lodge is so much more than a cheap place for backpackers to hang out. It’s what you’d call flashpacker, rather than backpacker. 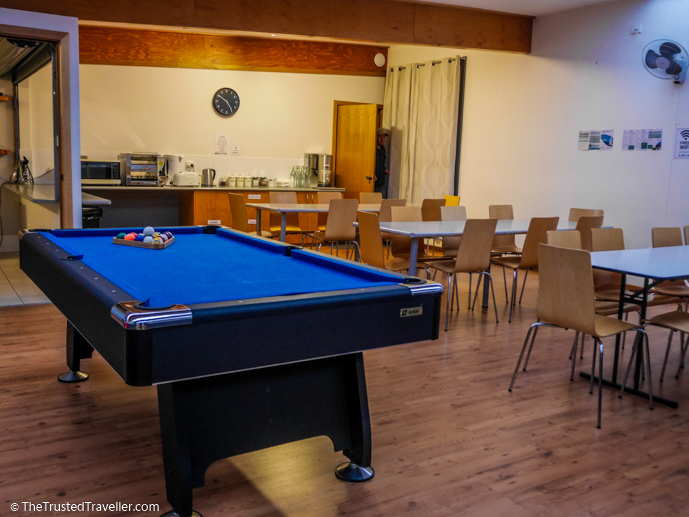 Every part of the lodge is modern, clean, spacious and packed full of facilities that can appeal to people of all ages, including young single travellers; couples of all ages; groups of friends travelling together; and families. It’s a lot more comfortable than any hostel we’ve stayed at in the past and we felt so relaxed and at home during our whole stay. The rooms come in a few different configuration so you can choose the one that suits you and your travelling party best. They offer private rooms, perfect for couples or families that sleep up to two or four people with either a king bed or two single beds and a double bunk bed. Or for larger groups, they offer private dorms that sleep up to eight people on bunk beds. We had a king bed and double bunk in our room but it was for our private use only. The room was very spacious with lots of space for our bags and still room to move around. The bed was very comfortable (probably the most comfortable we’d slept in for a while) with a firm mattress, soft sheets and warm doona. The temperatures dropped into the low single digits while we were there, but the heating in the room was more than sufficient to keep us warm at night. There’s also good ventilation, so we imagine the rooms would stay comfortably cool on a hot summer’s day too. But with such great facilities, we were only in our rooms to sleep. 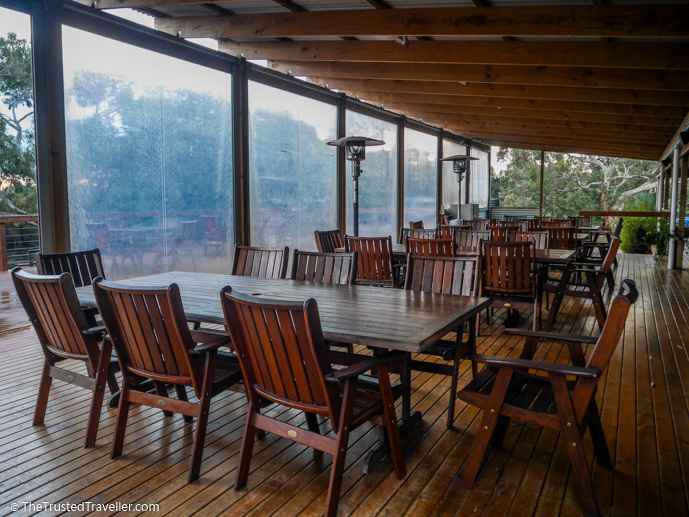 The facilities and communal spaces at Vivonne Bay Lodge are what made our stay so enjoyable. The property offers the perfect balance of spaces to relax and things to entertain you. Starting with the shared amenities, which are just steps away from the rooms. We found them to be spotlessly clean when we arrived and they stayed that way throughout our whole stay. We loved that the shower stalls were bigger than most other amenities blocks we’ve used and that there is plenty of dry space to hang your clothes and toiletries while you shower. 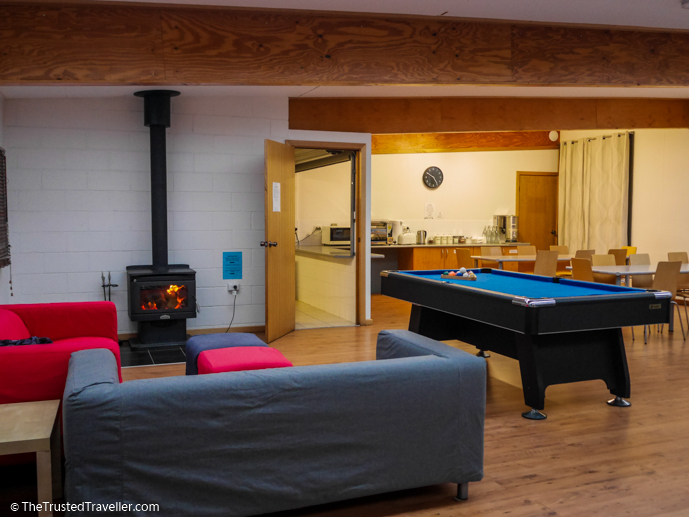 The big communal lounge/dining area is spacious enough to handle a full occupancy with lots of comfy lounges, a massive TV with satellite channels and DVD player and tons of seating at the three long communal tables. There’s games and books for guests use and a free pool table. But the best part about this area is the fireplace. The staff lit the fire for us each afternoon so when we returned from a day of sightseeing, the room so nice and cosy. They also keep a big stockpile of firewood so you can keep it going throughout the evening too. We spent our evenings reading and relaxing by the fire, which felt so luxurious. And the entertainment isn’t just in the lounge. 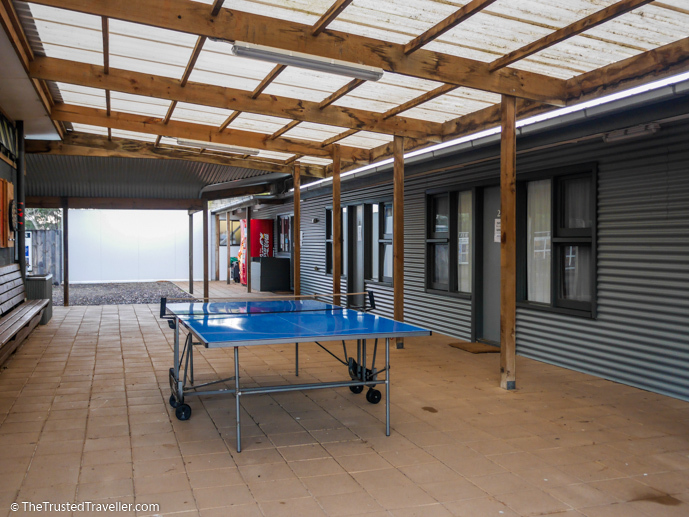 Outside is table tennis, a dart board and a bar with a huge covered deck that would be great for meeting other traveller’s when the lodge gets busy over summer. Cooking your own meals is made easy with a fridge to store your food and BBQ’s, stovetop, oven, and microwave to cook it. There’s also tea and coffee facilities and a commercial kitchen dishwasher that makes cleaning up after a meal simple. They can even provide you with BBQ packs of meats and salads if booked in advance. And if all of the above isn’t enough to convince you stay at Vivonne Bay Lodge then the bonus extras that they offer guests will. Free continental breakfast is served each morning in the lounge/dining. This includes tea, coffee, toast, cereal, fruit and juice. The property is home to over 10 km of signposted walking tracks for you to explore on foot or with the free bikes they provide. Keep your eye out for local wildlife seen regularly on the property like Kangaroos, Tamar Wallabies, Echidna’s and look up for Koalas. They also let you have free use of kayaks to use on the river a few minute’s walk away, and sand boards which you can take to nearby Little Sahara. Vivonne Bay Lodge is on Knofel Drive in Vivonne Bay. Just follow the signs that lead off the main road. The best way to get there is by car as there is very limited public transport on the island. Staff are on-site during the day to assist you with everything you need to make your stay comfortable and ensure you are set up for the evening, before they leave each day. They are also available by phone in case of any emergencies. Prices start from $120.00 per night. 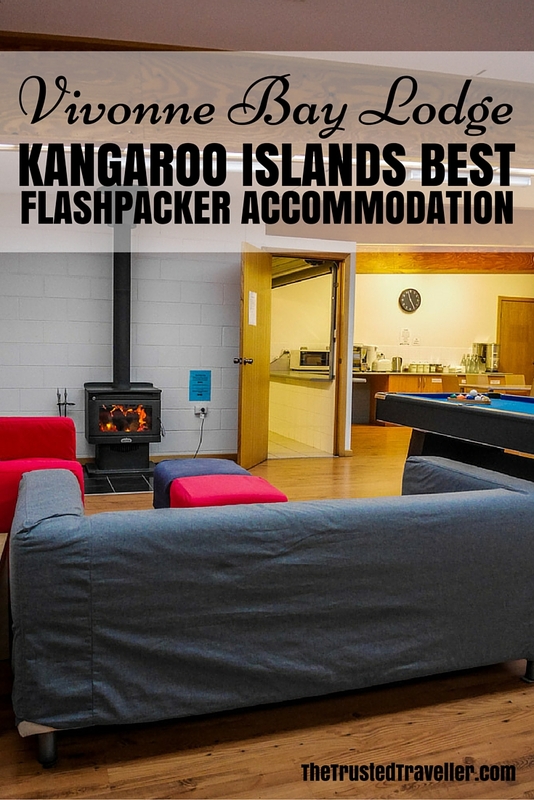 SeaLink Kangaroo Island can help you with booking your stay and offer discounts if you also book your ferry or flight to the island at the same time. A stay at Vivonne Bay Lodge is also available with their self-drive packages and on some of their organised tours. 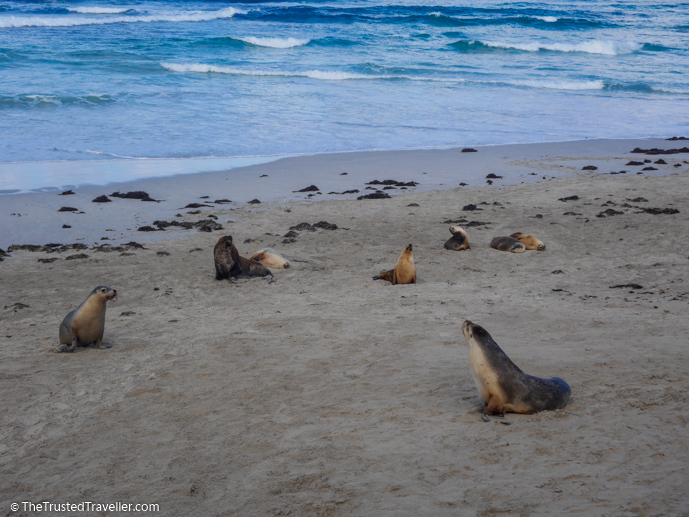 Disclaimer: Thank you to SeaLink Kangaroo Island and Vivonne Bay Lodge for hosting me. As always, all opinions expressed in this post are my own. 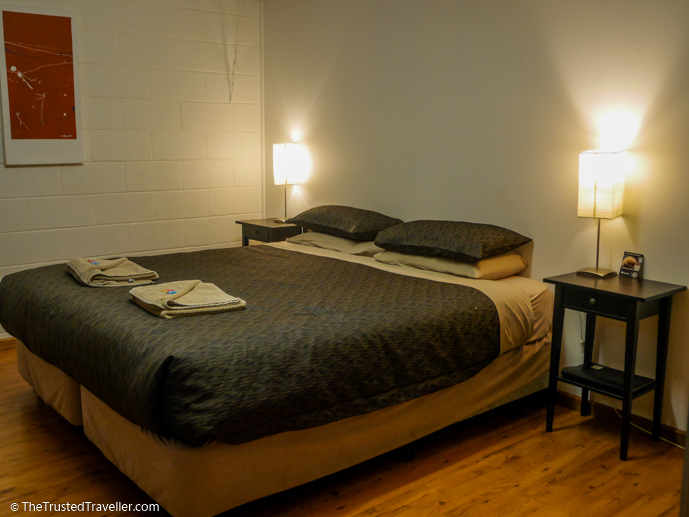 Have you ever stayed in flashpacker style accommodation? What did you think?